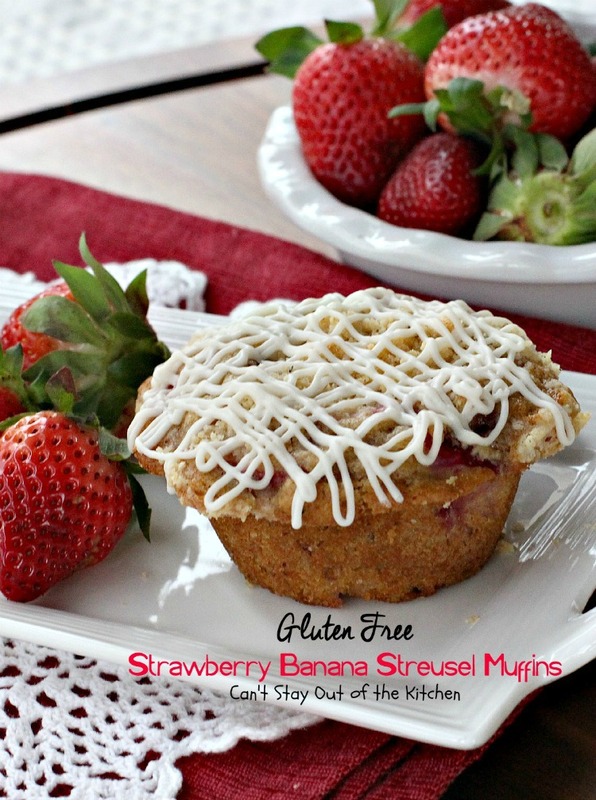 Healthy Gluten Free Strawberry Banana Muffins are simply awesome! They combine the best of healthy with the best of flavor and texture! They’re filled with a ton of strawberries, bananas and pecans. Every bite is amazing. I have made these muffins many, many times trying to get the correct texture, allowing for the muffins to raise enough and yet not be tough. Working with gluten free flour is a real adventure. Certainly all gluten free flours are NOT equal! Cup4Cup is probably one of the better gluten free flours on the market these days. The flavor is good and you don’t have to add extra flour to make up for the deficiency in texture versus wheat flour. I originally tried to make these muffins with honey. However, that makes the muffins too heavy so they sink too much in the middle. This time I used a coconut sugar which worked perfectly. So as a result of reducing the flour back to the original amount (1 1/2 cups) and substituting coconut sugar for the honey, the muffins turned out spectacularly. They were lighter and fluffier instead of heavy and tough – which is what you really want in a homemade muffin. 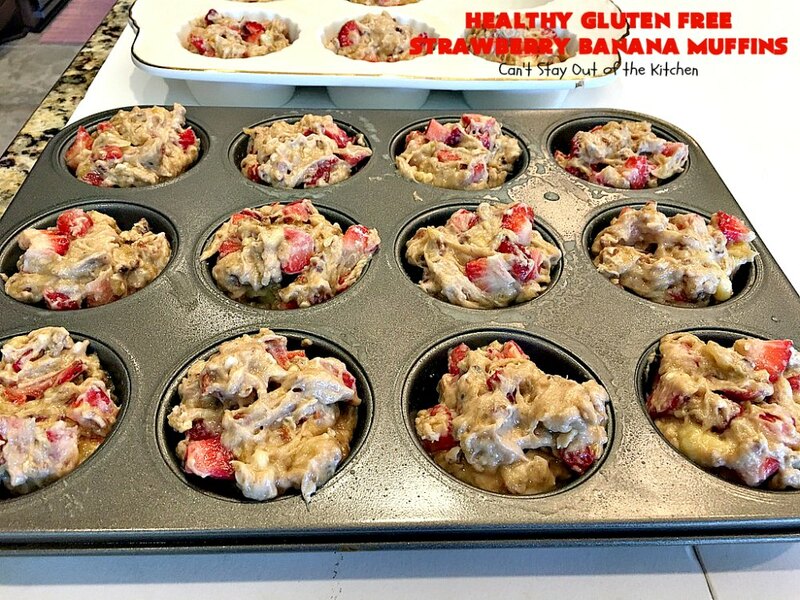 Most of you know I have a terrible sweet tooth, but Healthy Gluten Free Strawberry Banana Muffins are just the right treat when I’m trying to watch what I eat and stave off sugar cravings. These lovely muffins use coconut sugar instead of regular cane sugar and other clean-eating ingredients. These muffins also work better with really overripe bananas so you get the most sweetness into the recipe possible. I added strawberries and pecans and used a gluten free baking mix. You get just enough natural sweetness from the fruit and coconut sugar without spiking your blood sugar levels from using cane sugar or regular flour. Perfect. 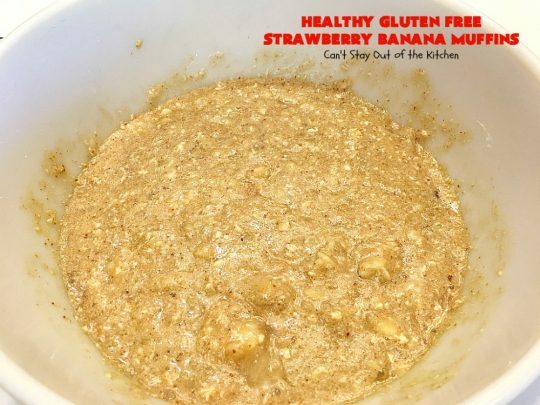 Back in early March I baked several homemade gluten free muffins with different fruits so I could stock my freezer with goodies before we moved into our new home. These are my own special treats. I pack them in large plastic containers and then pull them out for a sweet snack one at a time. While these are similar to my Healthy Gluten Free Banana Blueberry Muffins and my Gluten Free Chocolate Chip Banana Muffins, these muffins have pecans which add a nice crunch to the texture. If you’re looking for a dynamite way to make a healthy version of a delicious favorite, then give Healthy Gluten Free Strawberry Banana Muffins a try. 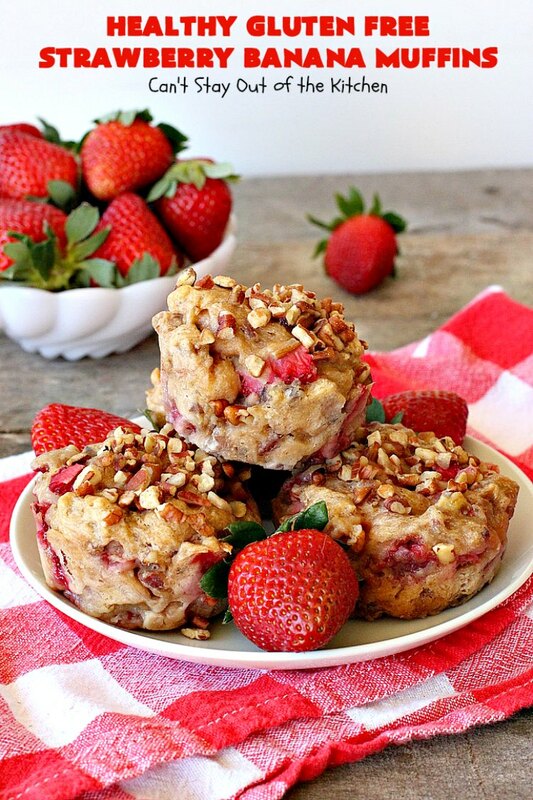 If you enjoy strawberries, this healthy muffin recipe is one you should check out. When I initially posted this recipe in May 2016, I tried several versions of this recipe before posting. Still, I was not as thrilled with the texture as I could have been. I even had one person complain bitterly about the results. 🙁 I recently remade this recipe (March 2018) and took new pictures. This time the results were phenomenal. They are the perfect treat for any holiday or company breakfast, too. Enjoy this delightful recipe. 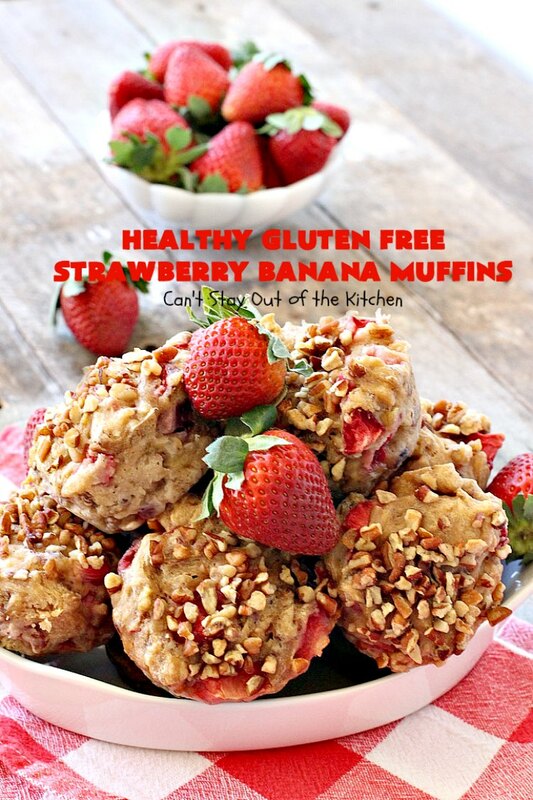 Healthy Gluten Free Strawberry Banana Muffins are terrific. These lovely muffins are great for a holiday breakfast. 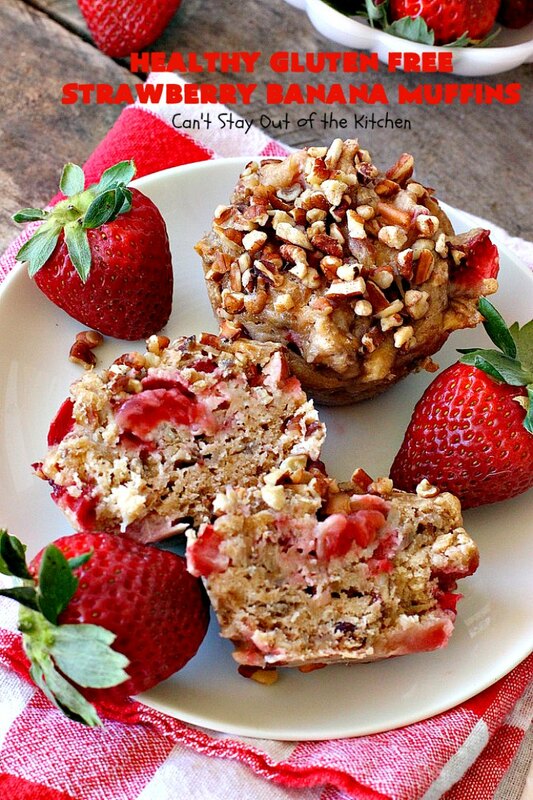 If you love strawberries and bananas, you’ll love these muffins. I used these ingredients. I used Cup4Cup gluten free flour instead of regular flour and substituted coconut sugar for regular sugar. Melt butter in mixing bowl. Add mashed bananas, an egg, coconut sugar, baking powder, Pink Himalayan sea salt, vanilla and milk. Whisk ingredients to combine. You don’t need to whisk too heavily. It’s okay to leave banana pieces. 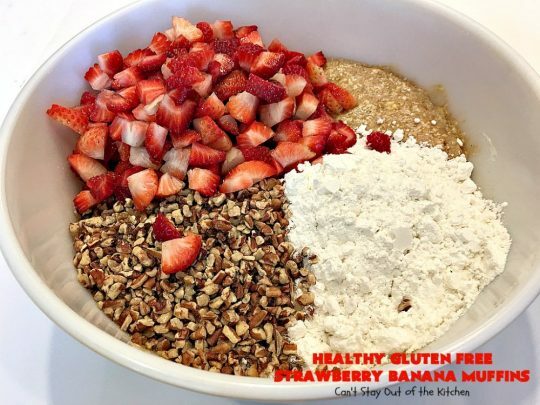 Add gluten free flour, pecans and strawberries. Grease muffin tins. Spoon muffin batter into each tin almost to the top. Sprinkle additional chopped pecans on top and press slightly into each muffin. 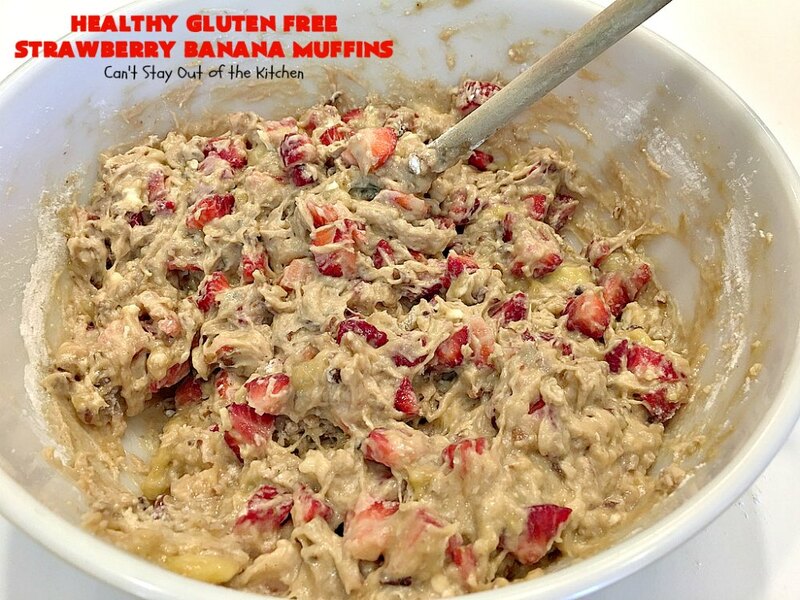 These muffins are a great option if you’re trying to stay away from sugar or have gluten intolerance. Every bite of Healthy Gluten Free Strawberry Banana Muffins will have you salivating. 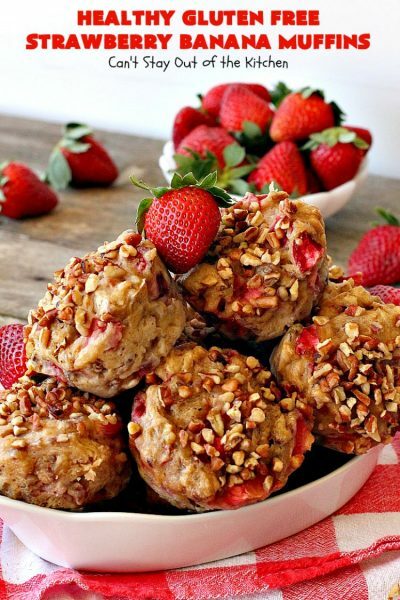 This is an easy clean-eating way to satisfy sweet tooth cravings. 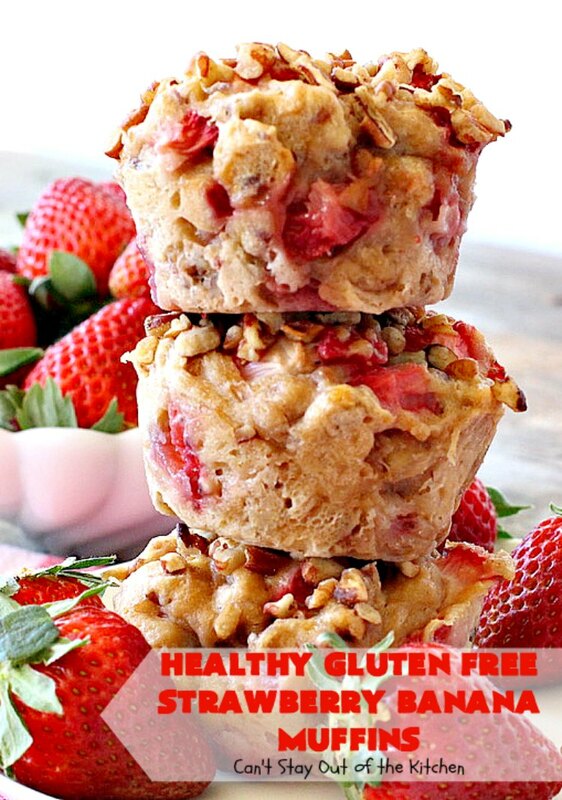 These delicious muffins are healthy, clean eating and gluten free. 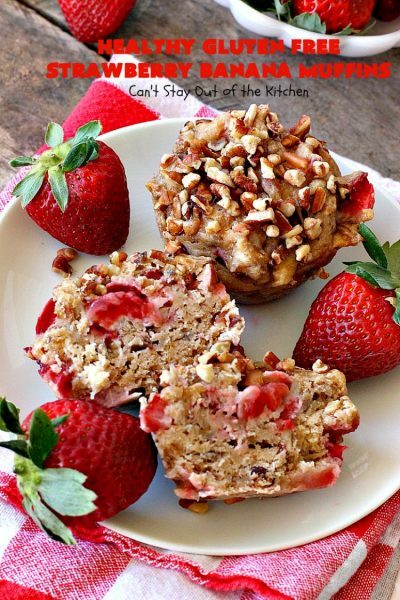 Strawberries, bananas and pecans provide wonderful flavor & texture. 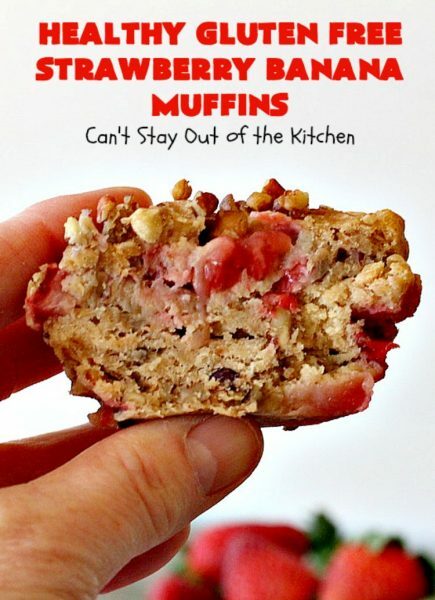 These are great for a holiday breakfast. Grease 12 extra large muffin tins with coconut oil. Add coconut sugar, baking powder, salt, bananas, egg, vanilla and milk in a large mixing bowl and mix with a whisk. It’s okay to leave some of the lumps from the bananas. 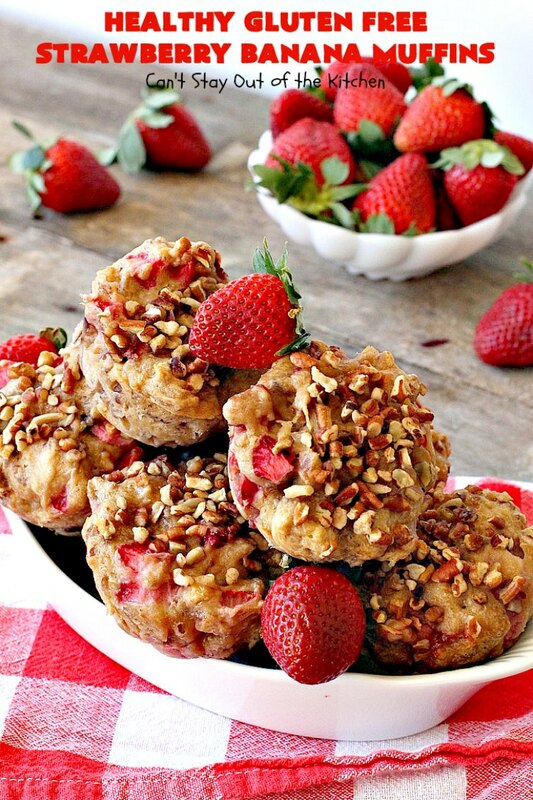 Add GF flour, strawberries and 1 cup pecans. Stir gently with a wooden spoon just until combined. Spoon batter evenly into each greased muffin tin. Sprinkle remaining pecans over top of muffins. Continue baking an additional 15-19 minutes or until a toothpick inserted in center comes out clean. Cool. Yield: 12 extra large muffins or about 14-16 regular sized muffins. 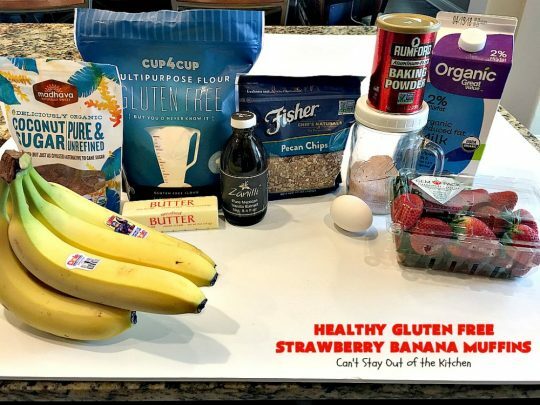 NOTE: My personal preference is to use a gluten free flour that's NOT Pamela's baking mix. I prefer Cup4Cup. Add honey, baking powder, salt, bananas, egg, vanilla and half-and-half in a large mixing bowl and mix with a whisk. Add flour, strawberries and 1 cup pecans. Continue baking an additional 15-19 minutes or until a toothpick inserted in center comes out clean. Cool. Yield: 12 extra large muffins or about 14-16 regular sized muffins. I’ve made this recipe with 1 1/2 cups flour (which is the amount on the original recipe) and caused the muffins to sink in the middle, and 3 1/2 cups flour which caused a rounded muffin top but the muffins were a little on the heavy side. I suggest 2 1/2 cups may be the best option for a lighter muffin but one that doesn’t sink in the middle. Much of this will depend upon the gluten free flour you use. Working with gluten free flour can be tricky, so this is my best advice. 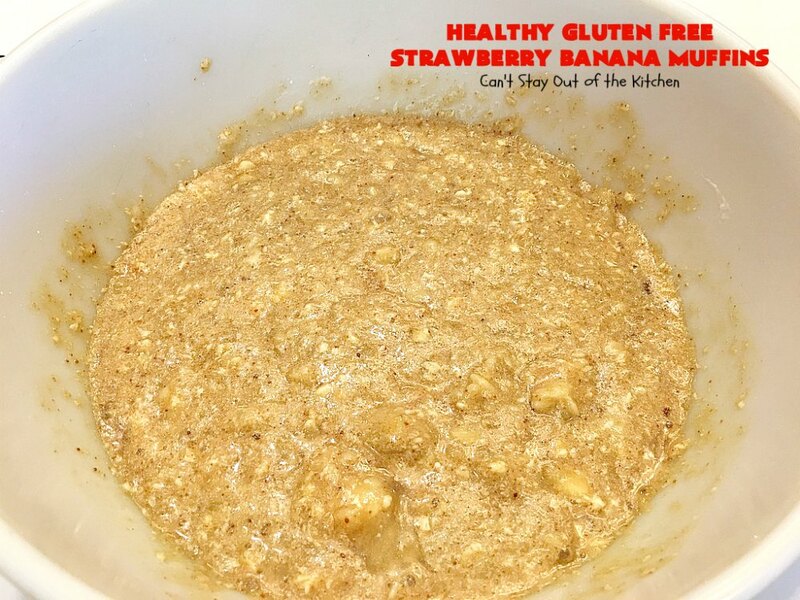 Healthy Gluten Free Strawberry Banana Muffins are lovely with fresh strawberries and Ham and Cheese Breakfast Muffins. 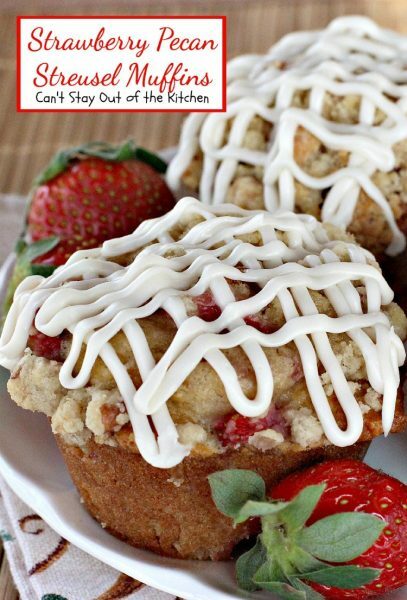 The texture of these muffins is wonderful. 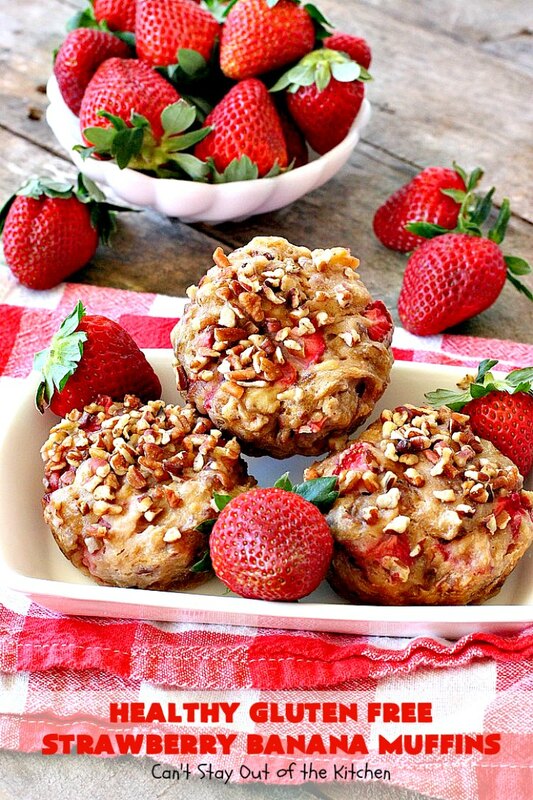 Serve these muffins with your favorite breakfast casserole for one fantastic breakfast. Enjoy. 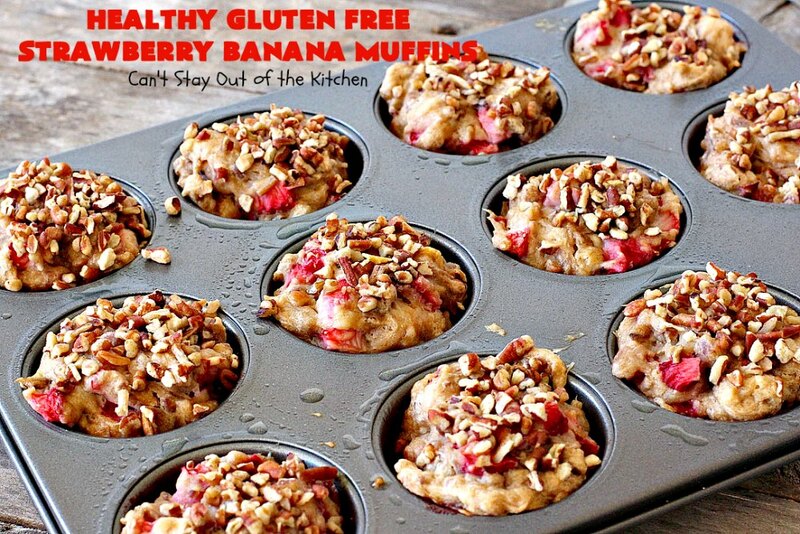 Hey Rozina, I actually have one of these called Healthy Gluten Free Mango Muffins. You may want to try that recipe. If you can find a substitute for the eggs, you can possibly make this vegan. You can substitute coconut milk for milk or cream. You may be able to substitute coconut oil for the butter in the recipe. Enjoy. Thanks a lot. Will try and post my comments. These were not good at all.. Bake time was wrong (not long enough) and recipe does not say when to put the melted butter into the mix. These just did not taste good at all, according to my husband and he will eat just about anything. Says a lot when he doesn’t like them..
Hi, Scarletta. I’m sorry you didn’t like them. The third instruction says to melt butter (after preheating the oven and greasing muffin tins.) Then you add the other ingredients. Each oven is different, that’s why my instructions include a line that states to wait until a toothpick inserted in center comes out clean. Some ovens may take longer, some shorter. 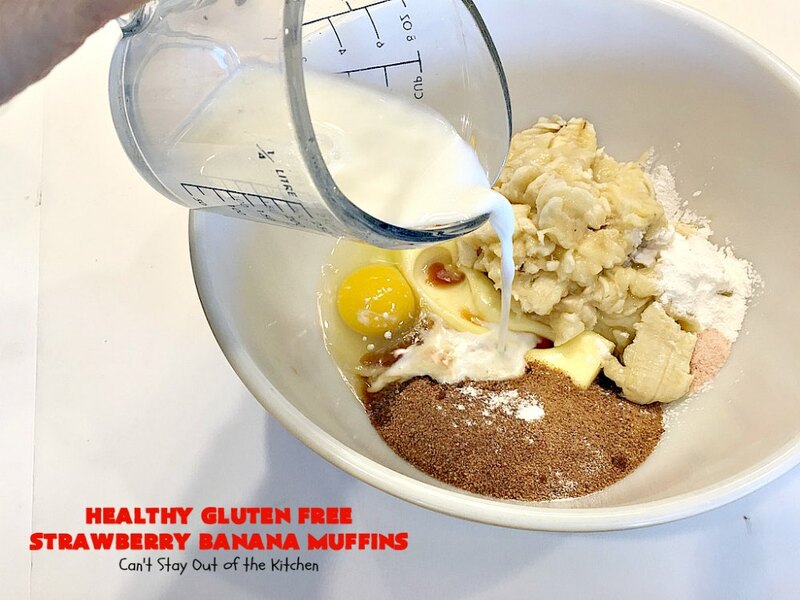 While these muffins aren’t as sweet as they would be if they were made with regular sugar, we found them a great and healthy alternative. Have a great week.